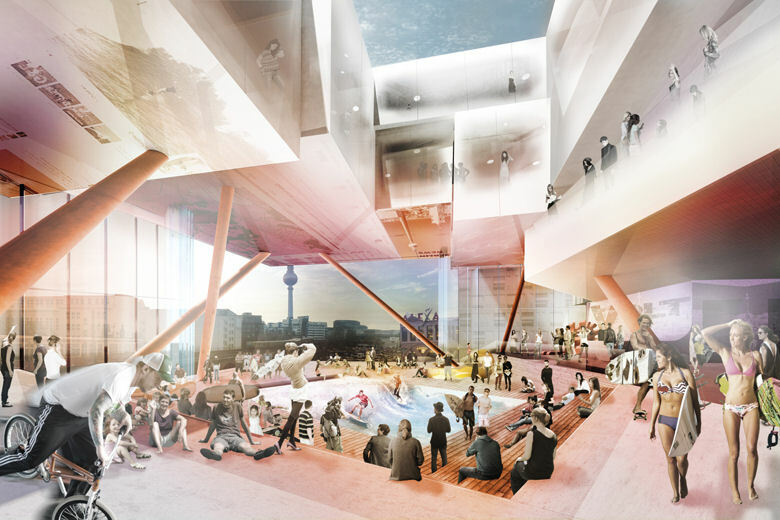 German team J. MAYER H. und Partner Architekten has won an invited competition to design a shopping and urban experience centre in Berlin. The retail facility will be located within close proximity to the Alexanderplatz public square. The winning submission is formed of a series of interlocking volumes, spliced through with a horizontal glazed line, illuminated from within in bright and eye-catching hues. Each of the boxes indicates a change of use and provides a self-contained unit for the brand or activity. VOLT Berlin, as the project has been termed, blends a multi-brand retail development with event space, a hotel and a series of experiential offerings ‘directed towards adventurous visitors with a focus on a smart urban lifestyle’. Indoor-skydiving experiences and a surf wave will be on offer in a void at the core of the building, located at the level of the train viaduct. This void forms part of the ‘energy line’ that runs horizontally throughout the development, blending into the urban space beyond the boundaries of the volume.